You can always wear only one (supplies available at Iosefkas), have so long until your lights the lantern in the cathedral district. Heals large amounts GP and increases stamina regeneration. You can only carry a vial, but gets any time by Arianna which, once it has settled in the cathedral district. Where large amounts GP restores and operates a hot (heal over time) to you. It’s dropped from most opponents or can be purchased from the Bath Messenger. You can carry up to 20 simultaneously. The maximum number can be increased by the Communion rune. The GP-recovery can be increased by the Radiance Rune of executioner fraction. Remove poison and poison construction. Can be purchased from Bath Messenger once you have the sword Hunter Badge found. Increases short time (60-70 seconds) Your Beast (increases both dealt and inserted physical damage). Can at various points in the Forbidden Forest and Iosefkas clinic be found and purchased from for insight in the dream of the hunter, you have once you defeat MERGOS nurse. Null the current madness structure. Sold by Bath Messenger once you have the Cosmic Eye Hunter badge found. Can also be obtained from the old woman in the cathedral. Blue Potion promises invisibility, but only in the idle state when you attack can be the effect after. Therefore, the strokes should be devastating when you install it. Can be found in the district of the great cathedral after exposure of the large church servants (rare). Can be found outside the big cathedral and Iosefas clinic. Can be purchased for 2 access points in the second bathroom messenger. The molotov cocktail of bouncy can be thrown and explodes on impact in a fireball. The same applies to the rope-molotov cocktail of bouncy, but is thrown backwards. The scaling of arcane damage is A, ie, the higher your Arcane, the greater the damage. In addition, you can increase the damage by using your opponents before an oil urn take. Logically, oil burns longer. the strong blood cocktail you throw a distraction. Many opponents (but not all) are distracted for 10 seconds and sniff blood. 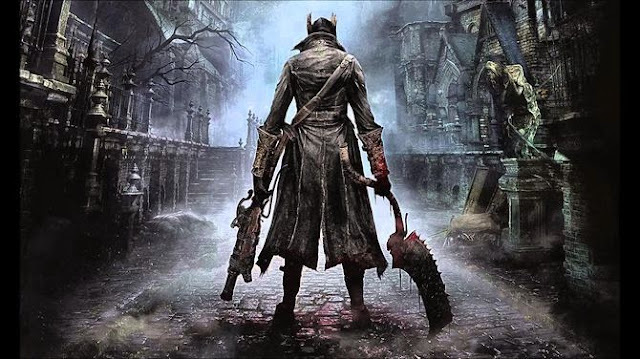 The numbing fog has the purpose to prevent the GP regeneration of hunters in PvP or by opponents as vicar Amelia. Lasts 30 seconds. Throwing Knife causes physical damage. Their damage scales with thickness (D) and skill (A). In addition, effects of are fire and lightning paper applied to your melee weapon for throwing knifes. The poison knife behaves similarly, but additionally has a 40-second slow poison effect. A small stone that can be thrown at enemies to get your attention. Fire paper and flash paper are used to add your trick weapon for 60 seconds additional fire or lightning damage. The additional Fire damage is not yet precisely established, the lightning damage is but 75 (without scaling). The paper can be purchased from the Bath Messenger after your get the beam sword-fighter badge (fire) or the spark hunter badge you (flash) found. Otherwise, you will find it lying around at opponents or in the world. Bone marrow ash increases the power of the shot next ball of mercury, which is fired (Holds 60 seconds or until the next shot). The effect also ends if your changes the weapon. The shamans bone blade is a melee weapon that is used to enemies (Note: Not all) for 20 seconds to make allies. The sign of a strong hunter puts you without blood loss echo back to the last lamp, have you used. Caution: In some locations where your spawn without lamp (example: nightmare Front), it may be that you will reset at this spawn point. Shiny coins cost 20 blood echoes and can point the way to a terrain. Knowledge of Insane and Grand-wisdom gives you 1 or 2 points insight in use. Gold pendant vicar of Amelia. Do you get once you've killed them. Used him to produce a gold-blood gemstone. The Tiny Tonitrus causes in use lightning emanating from the point of activation. If you have focused your opponent, the lightning strikes directly there. Its damage scales with S on Arcane. Thee Empty mirage can cover your Like the elementary paper rub on your trick weapon. So your adds 80 Arcane damage for 60 seconds. The bell choir you can use in co-op situations. It heals your co-op partner and you. Even poisons and slowing it heals. Cost 10 balls of mercury in use. The challenge your bell used to summon other players to Coop in your world. This bell used this to join other players and help them in their world. The PVP bell. Use it to enter the world of another hunter and fight him. The muffler can leave your other worlds, in which you came through the bells. Cause an explosion with subsequent projectiles track of your opponents. Scale by S on Arcane. The telescope is not just for the beautiful scenery, but you can depending on the range of the remote weapon also use it as a riflescope. A derivative of Molotov cocktails, which can throw back or let fall. Blood seeds are your reward for victories in PVP mode, if you are a member of Ekelblüter. However you get them killed by NPC if you have used the rune corruption. These blood sacrifices seeds of the Queen of Ekelblüter to rise through the ranks. Your use them, you get a point inspection. Speeds up your wheels and race to the opponent for a short period of time. This item can be used again and again to masquerade as Bad messenger, or as reference. Once you start an action that camouflage is repealed. Focused your opponent and uses this object and a blood-red, cloud passes your opponents from life. The item Best Inge howler can fall over your enemies, it uses 2 balls of mercury. Location: Forbidden Forest, in a dilapidated house in the village. With a mercury bulb, you can invoke the Augur of Ebrietas, the enemy is added to reduce damage. Location: In the Forbidden Forest, the village in an abandoned house. Bring this item to Viola (Quest starts before the boss fight with Father Gascoigne, then no more) and you will be rewarded.